Bonell Chevalier smacked two run-scoring doubles in this July 1990 win for short-season Bend, hits in contrast to his season .194 average, according to The Bend Bulletin. Chevalier attributed his success that night to changes he'd made, and he hoped to continue that success, he told The Bulletin. "I've been working hard on my hitting," Chevalier told The Bulletin through a teammate interpreter. "I feel like I'm hitting well. I'm confident I can keep doing the job." Chevalier could only continue that success for so long. That season marked his third as a pro. It also marked his last. He never made single-A. 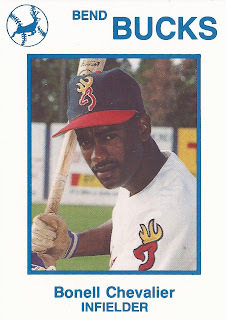 Chevalier's career began in 1988, signed by the Mariners as a free agent out of his native Dominican Republic. Chevalier's name has also been spelled Boneel Chevalier, Bonel Chevalier and Boanerge Chevalier. Chevalier started with the Mariners in the rookie Arizona League. He hit .319 over 30 games and stole 12 bases. He moved to short-season Bellingham for 1989. In 48 games there, the infielder hit .179 and stole 14 bases. His Bellingham card lists his favorite hobbies as basketball and music. Chevalier then played 1990 at Bend. He got into 58 total games, stole 16 bases and hit .210 to end his career.